World leaders have descended upon St. Petersburg, the ‘northern capital of Russia,' for the eighth G20 summit which runs September 5-6. The meeting is chaired by Russian President Vladimir Putin. 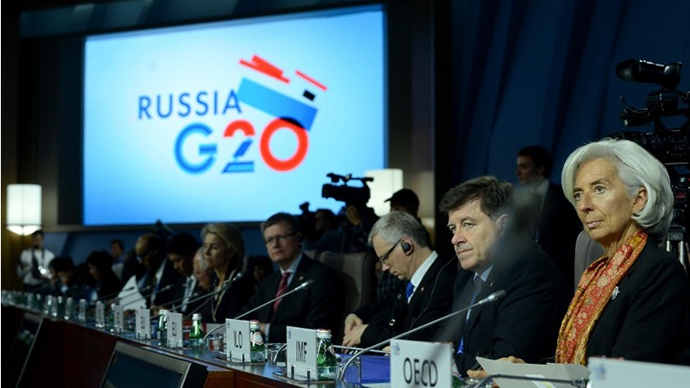 The St. Petersburg conference marks the G20’s fifth anniversary. 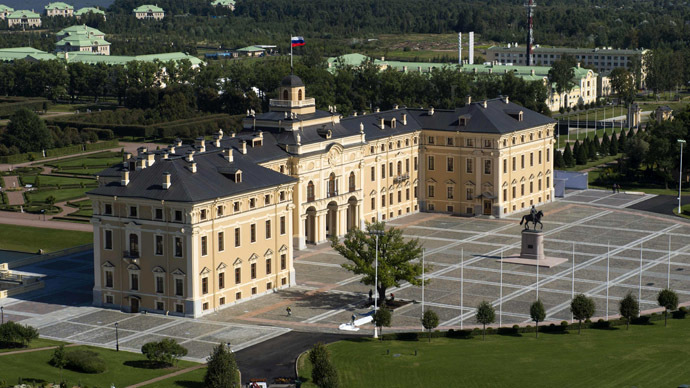 Leaders will gather at Peterhof Palace to agree on coordinated measures on banking reform, tax and trade regulations, and how to spark sustainable economic growth. 18:00 MSK: Russian president Vladimir Putin will meet Spanish premiere Mariano Rajoy on the concluding day of the G20 summit. This will be the first meeting between the two heads of state since the present Spanish government came to power in December 2011. There will also be a bilateral meeting between Putin and President Park Guen-hye of South Korea. Talks will cover the upcoming visit by the Russian leader to the Republic of Korea in November as well as the tense situation on the Korean peninsula. 17:51 MSK: President Putin wraps up the Q&A session. 17:47 MSK:"China is Russia's strategic partner. Our turnover with China is at $57bn - more with any other country. Above trade, we also cooperate in high - tech, aircraft manufacturing," says Putin. 17:37 MSK: Answering the question about the need not to forget environmental issues while stimulating the economy, Putin says enough attention is being paid to ecological issues, though promising to try and do better in the future. "We do not start any project without environment study," Putin said. 17:24 MSK: Unrest in the Middle East destabilizes the global economy, as the region has lots of natural resources, Putin says. 17:20 MSK: Russia's President says it's necessary to have one single reserve currency. 17:18 MSK: The IMF quotas should be reformed as soon as possible - Putin. 17:17 MSK : Putin says BRICS club is one of Russia's priorities. 17:14 MSK:"Main subject of G20 was combating corruption. We have adopted an anti-corruption plan," Putin says. 17:13 MSK: Putin urges for better transparency in energy issues. 17:10 MSK: Putin says Russia managed to develop in all directions. 16:36 MSK: Waiting for Putin. Watch the press conference here. 16:34 MSK: The G20 Leaders Declaration has been published following the G20 Summit in St.Petersburg. 16:30 MSK:"The G20 has proven its worth, in the face of the major challenges the global economy has experienced over the last 5 years, as the world's premier forum for economic cooperation: all G20 members remain determined to implement our ambitious commitments and take further steps on the way to strong and sustainable growth," European Council President Herman Van Rompuy and European Commission President José Manuel Barroso said in a joint official statement. 16:24 MSK: The final G20 communique is 24 pages, touching upon jobs, growth, and tax reform. No mention of Syria. 16:02 MSK: Putin will expand on his previous theme that the global economy needs 'new sources of growth' in order to ensure long-term stability. 15:51 MSK: So far tax reform has been a unifying issue at this year's G20, with promises to strengthen regulatory tools to curb tax evasion. 15:48 MSK: Putin's press conference has been delayed until 16:30, when he will present the outcomes from the G20 conference. 15:24 MSK: Russian Foreign Minister Sergey Lavrov met with his Canadian counterpart on the sidelines of G20 to discuss Syria and other international issues. 15:17 MSK: Obama is still scheduled to meet with human rights activists after Friday's G20 meetings. 14:57 MSK: Leaders have taken their places at the trade and growth working lunch. 14:40 MSK: Next up, growth and trade talks. 14:35 MSK: Leaders gather to take the 2013 official family portrait. Watch here. 14:10 MSK: The G20 has unveiled the official St. Petersburg Development Strategy, a four page document outlining key initiatives on global economic development. Financial stability, regulation, and tax reform coordination were emphasized. 13:50 MSK: G20 leaders are assembling for the official summit photo. 13:20 MSK:"We support institutional and regulatory reforms for creating appropriate conditions for developing markets," Vladimir Putin said in his opening remarks at the round table. 13:11 MSK: The G20 summit “is very successful and will be a landmark event in the history of relations,” Wang Yi, China's foreign minister, said. 12:55 MSK: Leaders taking their seats at the round table discussion. Watch here. 12:28 MSK: David Cameron will chair a meeting on Syrian humanitarian aid. 12:29 MSK: RT correspondent Katie Pilbeam gives a wrap-up of the leaders' meeting with business community and labor unions. Hot issues included youth unemployment, the lack of global investment, and better international financial regulation. 12:23 MSK:"Overall, we see a number of problems- divided banking in the EU, the reduction of fiscal space, the decrease in lending capacity, and the tightening of fiscal regulation," Putin said. Putin stressed encouraging investors to boost long-term growth in insurance companies and pension funds, which he estimated to be about $90 trillion in 2012. 12:22 MSK:"We can only be efficient working together with representatives of the business community and trade unions, only by joint efforts we can achieve our goals," President Vladimir Putin. 12:20 MSK:"This is a pro-business agenda, you shouldn't be frightened of it. Please grab it," Prime Minister David Cameron said. "The honest have nothing to hide." 12:19 MSK:"We've created 1.3 million net private sector jobs, the most in Britain's history, and I attribute this to our flexible labor market." - UK Prime Minister David Cameron. 12:08 MSK:"All our financial commitments should be regulated internationally." - German Chancellor Angela Merkel. 12:05 MSK:"Our common goal is economic recovery and growth." - French President Francois Hollande. 12:00 MSK: Leaders have agreed on regulating 28 'too-big-to-fail' banks and nine insurance companies, Russian Finance Minister Anton Siluanov told reporters. The minister also stressed the need for additional rating systems. "A lot was said about shadow banking, because this sector needs to be regulated. Operations that are carried out by banks come under prudential oversight, operations of the shadow banking sector are not subject to regulation, which leads to questionable transactions, and tax evasion. This sector needs to be reformed," Siluanov said. The measure to regulate shadow banking was led by Germany and Indonesia. 11:55 MSK:"Europe is in a bad position because we have a highunemployment level, especially for young people. That is why we badly need short-term measures. We can’t let our society wait and become unstable," said Herman Van Rompuy, President of European Council. 11:30 MSK: Vladimir Putin meets with representatives of the business community. Watch here. 11:35 MSK: The global economy loses about $1 trillion a year because of inefficient infrastructure investments, and the world faces $60 trillion in infrastructure needs through 2030, according to Kirill Dmitriev, CEO of the Russian Direct Investment fund. Economic growth will grow by 3 percent if the G20 reduces restrictions on capital flow, encourages private capital in infrastructure, and makes infrastructure investment more efficient. 11:18 MSK: European nations - Britain, France, Italy, and EU institutions - held a separate meeting on Syria this morning, which was inconclusive. 11:09 MSK:Sochi medals on display at G20. 10:55 MSK: Russia's Minister of Labor Maksim Topilin announced draft laws on pension reform will be submitted to the State Duma in September. 10:45 MSK: Russian representatives oppose the creation of a G20 secretariat, stating it would be inefficient and further distance them from people. This opinion differs from ex-finance minister Aleksey Kudrin's push for the secretariat. 10:42 MSK: Though every at G20 is talking about Syria, Putin's spokesperson has already said there would be no joint #G20 statement on Syria. 10:40 MSK: China, Russia, and UN Secretary-General Ban Ki-moon are united against a Syria strike, Obama is for, and Europe remains divided on the issue. France has thrown support to the US, while Germany and Italy have said they won't support the strike. 10:38 MSK: UN Secretary-General Ban Ki-moon insists the Geneva-2 meeting must be held ASAP and the only way to resolve Syria is through diplomacy. 10:33 MSK: The third meeting of G20 leaders will focus on finance investment, Deputy Finance Minister Sergey Storchak informed at Thursday morning's briefing. 10:23 MSK: RT's correspondent Alexey Yaroshevsky kicks off day two in St. Petersburg. 10:20 MSK: Both China and India have urged the US to carefully plan their stimulus tapering, but both have said there is no need for an emerging market rescue plan. 10:07 MSK: Putin will hold bilateral talks with Spanish Prime Minister Mariano Rajoy and South Korean President Park Geun-hye. 9:58 MSK: UN Staff doesn't intend to leave Syria despite dangerous situation, UN chief Ban Ki-moon said, but still contends there is 'no military solution' to Syria. 9:50 MSK: At 10:00 Ministers of Labor will discuss employment and job creation. 9:40 MSK: British PM David Cameron, whose plan to launch a missile strike on Syria was shot down by MPs, has pledged an extra $81 million to humanitarian aid efforts in Syria. 9:34 MSK: President Obama will hold his press conference at 17:50. 9:15 MSK: World Bank President Jim Yong Kim told CNBC that G20 leaders share a 'unanimous outrage' of what happened in Syria. 9:00 MSK: President Vladimir Putin and British Prime Minister David Cameron after the working dinner at 2:00am and discussed Syria, according to Putin's press spokesperson and Cameron's Twitter account. After dinner leaders enjoyed a water show at the Constantine Palace. 19:30 MSK: We are wrapping up our economic coverage of G20, click here for ​Syria live updates. 19:25 MSK: Russia spent around US$60 million to put on the St. Petersburg summit, and about $180 million during its full year as G20 chair. 19:20 MSK:Former UN Secretary-General Kofi Annan wants leaders to focus on tax evasion at tomorrow's meetings. 19:16 MSK: Russia's foreign minister is to meet his Syrian counterpart in Moscow on Monday. 19:15 MSK: Russia isn't convinced by US proof that Assad or the Syrian army used chemical weapons on the Syrian people, presidential spokesman Dmitry Peskov said. 19:13 MSK: Growth in emerging markets - which were strong until recently and a major force for global recovery - has slowed down, Indian PM Manmohan Singh said. 19:01 MSK: Journalists at the G20 summit have so far eaten 26 tons of food. 18:17 MSK: Peskov is addressing the press. 18:12 MSK: American Ambassador Michael McFaul shares a photo from the summit's picturesque palace setting. 17:52 MSK: Putin's spokesperson, Dmitry Peskov, will give a summit briefing in 45 minutes. 17:35 MSK: Syria talk can wait until dinner. Putin asks leaders to "not mix up and bundle" economic and political issues. 17:33 MSK:“We must prevent processes that lead to outflow of capital,” Putin said. 17:32 MSK:“We require compromised solutions among the world’s leading economies," Putin said. 17:32 MSK:"We need to increase the vote quota for emerging markets within the IMF framework," Putin said. 17:28 MSK:“We must not become complicit with tax evasion,” Putin said. 17:26 MSK:"We would be premature to sit back and relax. We need to return to re-establishing world economic growth," Putin said. 17:25 MSK:"Cash handouts cannot go on forever," Putin said. 17:10 MSK: A highly-anticipated handshake between Putin and Obama. 16:45 MSK: Putin formally welcomes world leaders to the summit. 16:37 MSK: A round-table forum is currently discussing ways to combat unemployment and create jobs. 16:29 MSK: One of the most pressing issues of global management is reforming the International Monetary Fund, Putin said. 16:27 MSK:"It is important that our countries seek to take common positions on global development," Putin said at the BRICS group meeting, stressing the bloc's growing authority in global economics. 16:24 MSK: "Russia-US relations need another 'reset,'" Peskov said. 16:00 MSK:"Putin will be happy to see Obama in St. Petersburg," Putin's spokesman, Dmitry Peskov, said in an interview to RT. He again stressed that a separate bilateral meeting between the two leaders has not been planned. 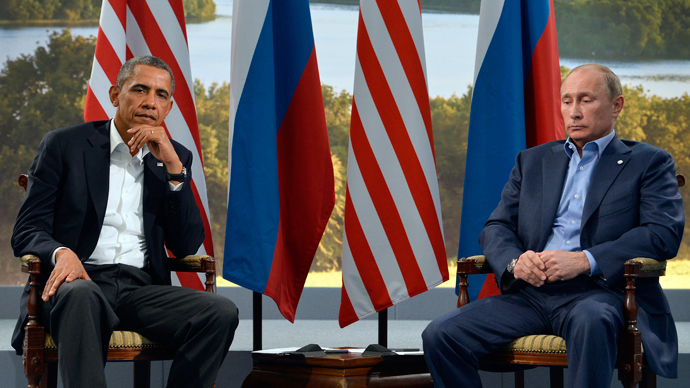 15:51 MSK: The White House has not yet ruled out a Putin-Obama meeting on the sidelines. 15:34 MSK: BRICS will create a $100 billion dollar foreign exchange reserve fund, Putin said at the opening of the meeting between Brazil, Russia, India, China, and South Africa. 15:26 MSK: Putin sits down with BRICS leaders at a round-table discussion. 15:06 MSK:"Italy has always been a privileged work partner, despite whatever temporary difficulties," Putin said. "Italy is Russia's fourth-largest trade partner," he continued. 15:00 MSK:"The Syrian conflict must have a political solution," Barroso continued. 14:40 MSK:"This G20 summit will deliver a paradigm shift in taxation," said Jose Manuel Barroso, President of the European Commission. 14:43 MSK: Team RT at the G20 summit. 14:42 MSK: Russian Foreign Minister Sergey Lavrov and Defense Minister Sergey Shoigu will visit Tokyo on November 1-2 to develop relations. 14:24 MSK: Obama's first stop will be a meeting with Japan's Shinzo Abe. 14:19 MSK: Obama has arrived at St. Petersburg Pulkovo Airport. 14:12 MSK: Obama will hold bilateral talks with Hollande, but not with Cameron. 14:10 MSK: CEO of the Russian Direct Investment fund, Kirill Dmitriev, is giving a talk. A live interview with RT will follow. 14:02 MSK: China supports Russia's position on Syria. "Military action would have a negative impact on the global economy, especially on the oil price - it will cause a hike in the oil price," Chinese Vice Finance Minister Zhu Guangyao told reporters in a briefing. 13:55 MSK: Putin and Japanese Prime Minister Abe wrap up their meeting on trade cooperation and investment opportunities. Putin noted the "deepening cooperation" between the two nations' trade relationship. 13:53 MSK: British Prime Minsiter David Cameron has touched down in St. Petersburg, with French President Francois Hollande arriving shortly after. 13:52 MSK: Obama postpones his meeting with human right activists in Russia. 13:40 MSK: UK delegation to arrive shortly. 13:16 MSK:"BRICS countries will play a key role in global growth development," said Vadim Lukov, Russia's Ambassador at Large. 13:13 MSK: India's Prime Minister, Manmohan Singh, will push President Obama for a less severe exit from US Federal Reserve tapering. 12:58 MSK: Several bilateral China-Russia agreements were signed after the trade meeting. Novatek, a Russian gas producer, and China National Petroleum Corporation (CNPC) signed a purchase-sale contract for 20 percent of Yamal liquid natural gas (LNG) shares. The companies are still in talks over how much liquid natural gas CNPC will buy from Novatek. 12:54 MSK: Follow RT's live stream at #G20. 12:47 MSK:"Relations between our countries are developing consistently," Putin said at trade meeting with China. 12:37 MSK: Chinese President Xi Jinping offered condolences to President Vladimir Putin over the devastation of the Amur flooding in the Far East, and promised future joint flood control efforts with Russia "to overcome natural disasters." 12:32 MSK: Leaders and finance ministers have gathered for a round-table on international monetary and financial regulation reforms. 12:23 MSK: China’s vice finance minister, Zhu Guangyao, warns about future US Federal Reserve tapering happening too early. 12:15 MSK: Russian and Chinese delegations sit down to discuss trade relations, including oil. 11:50 MSK: Both Japanese Prime Minister Shinzo Abe and Turkish PM Recep Tayyip Erdogan have arrived in St. Petersburg. 11:47 MSK: US Ambassador Micheal McFaul is driving to the St. Petersburg Airport to meet President Obama, who is scheduled to arrive at 13:50 Moscow Time. 11:40 MSK:"Financial unawareness was one of the key reasons behind the ongoing world economic crisis. These were ordinary people who bought risky credit products, without proper assessment of the possible results. This finally made the so-called credit bubble burst," said Angel Gurria, secretary general of the Organization for Economic Cooperation and Development (OECD). 11:37 MSK: The Arab League is sending its peace envoy, Lakhdar Brahimi, to the G20 summit in St. Petersburg to assist UN Secretary General Ban Ki-moon's efforts in organizing a peace conference, a UN representative said. 11:34 MSK: G20 summit documents are 99.9% finalized, according to Russian sherpa Ksenia Yudaeva. 11:28 MSK:"High consumer debt among young people is dangerous as they usually don't have any stable source of income," said Russian Finance Minister Anton Siluanov. 11:25 MSK: Russia is set to launch its national strategy for financial awareness in 2014, in cooperation with the OECD. 11:17 MSK:"People today make bad investment decisions because of lack of awareness, which can result in serious problems for the whole global economy," said Siluanov. For example, in the Netherlands, about 72 percent of the population don't know anything about pension schemes. 11:15 MSK: Siluanov presented a G20 report on financial awareness. Siluanov said that developing financial literacy is crucial for the financial stability of countries all over the world. The scale of the problem is tremendous. 11:06 MSK: No separate meeting between Obama and Putin is planned, but the leaders will certainly see each other, Putin's spokesman, Dmitry Peskov, said. This has also been confirmed by sherpa Ksenia Yudaeva. 10:58 MSK: Russian Finance Minister Anton Siluanov is set to take to the stage at 11:00am to discuss financial education. 10:45 MSK:Syria is not on the G20 agenda, according to Putin's spokesperson Dmitry Peskov. 10:37 MSK: BRICS nations will meet Thursday at 13:00 to discuss an IMF bank alternative. 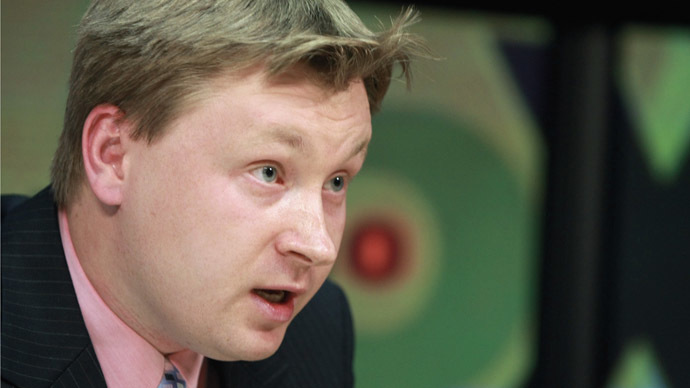 10:30 MSK:"Russia's position on deoffshorization coincides with those of other G20 states," said Sergey Storchak. 10:21 MSK:“The biggest concern is going to be the slow growth. There has been some slowdown in almost all developing countries and we need to discuss sources of long term growth,"Russia's sherpa for the Saint Petersburg G20 summit, Ksenia Yudaeva, said. 10:16 MSK: Russian Deputy Finance Minister Sergey Storchak and Russian sherpa Ksenia Yudaeva give opening remarks at the G20 summit. 10:02 MSK: Russia and China are expected to discuss their $270 billion oil deal at 12:00pm, which they signed at the St. Petersburg International Economic Forum in June. 9:51 MSK: This will be the first meeting between Obama and Putin since their ongoing stand-off over Syria began after a chemical weapons attack took place in Damascus on August 21. 9:48 MSK: As leaders prepare for economic talks, the Syria question casts a shadow over the summit. 9:34 MSK: China is optimistic about the future of trade with Russia. 9:28 MSK:Peterhof, the summer residence designed by Peter the Great, is famous for its spectacular fountains. The palace is the site of G20 talks. 9:15 MSK: Thursday's meeting will address tax avoidance. Leaders are expected to sign an agreement building off of the declaration signed at the G8 meeting in Northern Ireland in June. 9:05 MSK: An International Monetary Fund report prepared for the G20 summit in St. Petersburg says the growth of the global economy is dependent on emerging economies, and that summit policy should include "some intervention to smooth current market volatility." 8:41 MSK: RT correspondent Alexey Yaroshevsky is reporting live from St. Petersburg.